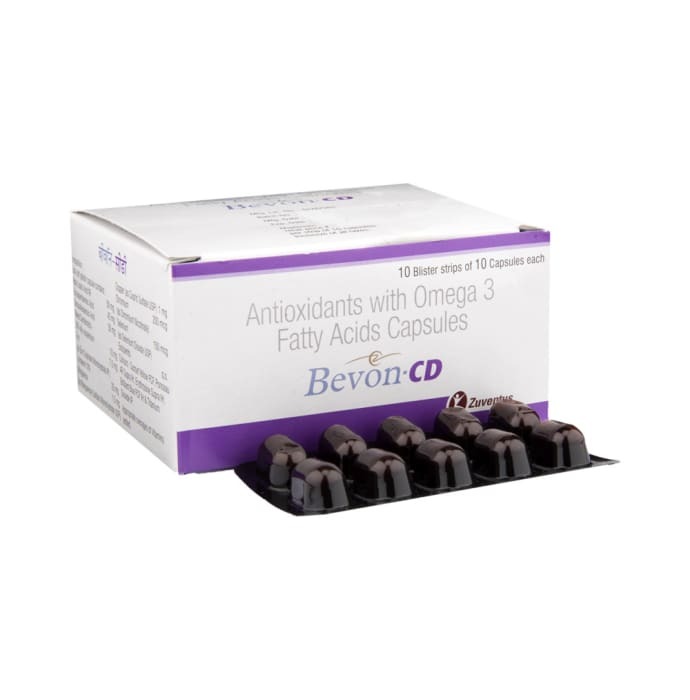 Bevon-CD capsule is an antioxidant capsule which contains Beta-carotene, Alpha-lipoic acid, Docosahexanoic acid, Eicosapentanoic acid, Lycopene, Copper, manganese, Selenium, Chromium and Zinc sulphate. Chromium and Selenium reduces blood glucose levels and HbA1c in patients with type 2 diabetes.Alpha lipoic acid, Beta carotene , Docosahexanoic acid, Eicosapentanoic acid, Lycopene is rich in antioxidants and reduces the free radicals produced in Diabetic and Cardiovascular patients. They also help with reducing the risk of heart disease, lowering bad cholesterol levels, increasing good cholesterol levels. Bevon-CD is indicated in Diabetic Neuropathy, Diabetic Nephropathy, Diabetic retinopathy, CVD and Alcoholic Neuropathy. Multiminerals in Bevon-CD maintains a healthy functioning body, and contributes to Antioxidant and nutritional supplement in cardiovascular diseases and diabetes mellitus. A licensed pharmacy from your nearest location will deliver Bevon -CD Capsule. Once the pharmacy accepts your order, the details of the pharmacy will be shared with you. Acceptance of your order is based on the validity of your prescription and the availability of this medicine.